Dagger Pinstriping Brushes series 30 are made by Andrew Mack Brush Company. Dagger Pinstriping Brushes series 30 have two side to Pinstripe with verses one side on Sword Pinstriping brushes. Dagger Pinstriping Brushes work more like a pencil and are great for detail work known as "Ginger-Bread". I find Dagger Pinstriping Brushes better for control, and Sword Pinstriping Brushes better for Long Pinstripe lines. Dagger Pinstriping Brushes series 30 made in the USA, with a European dressed squirrel hair stripers brush. Brushes are made of three sections - the root, where the ferrule (the wire band or thread that keeps hairs attached to the brush) is located, the belly section in the middle, and the end tip. Most artists either blunt the normally pointed tip of the brush, or slightly alter the belly. 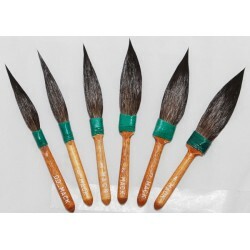 Water-soluble sizing is used to keep brushes stiff during shipping; they need to be cleaned right out of the package. After the sizing is rinsed out, the brush is ready to be shaped. Which Pinstriping brush? This is a question that is asked regularly, and it really is personal preference. It really comes down to what fits into a person’s hand and they are comfortable with. This will vary for each person. It has been recommended that a shorter handle lengths for beginners so they have better control pinstriping cars, boats, trucks or whatever you want to. Individual Dagger Pinstriping Brushes series 30 listed Below! Dagger Striper Brush Series-30 Size 00 by Mack Brush Series 30 Available in Sizes 00-4 Squirrel Hair Dagger Stripers 100% Pure Unmixed ..
Dagger Striper Brush Series-30 Size 000 by Mack Brush Series 30 Available in Sizes 00-4 Squirrel Hair Dagger Stripers 100% Pure Unmixed..